Preheat oven to 400°F. Remove dough from package (do not unroll). Cut dough into 12 even discs. Press discs evenly into the wells of Brownie Pan. Bake 8-10 minutes or until golden brown. Spoon about one tsp of sauce over each crust. Shave thin ribbons from the side of the cheese using the Serrated Peeler. 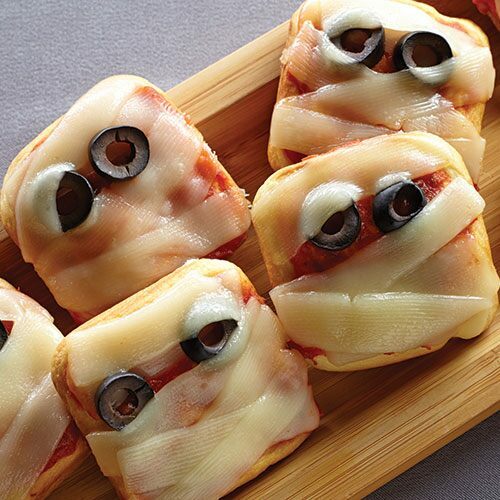 Layer cheese at angles over the sauce to form the “wraps” of the mummy face. Slice olives into rounds using Egg Slicer Plus® and place on each pizza to make the eyes. Remove from pan and serve.